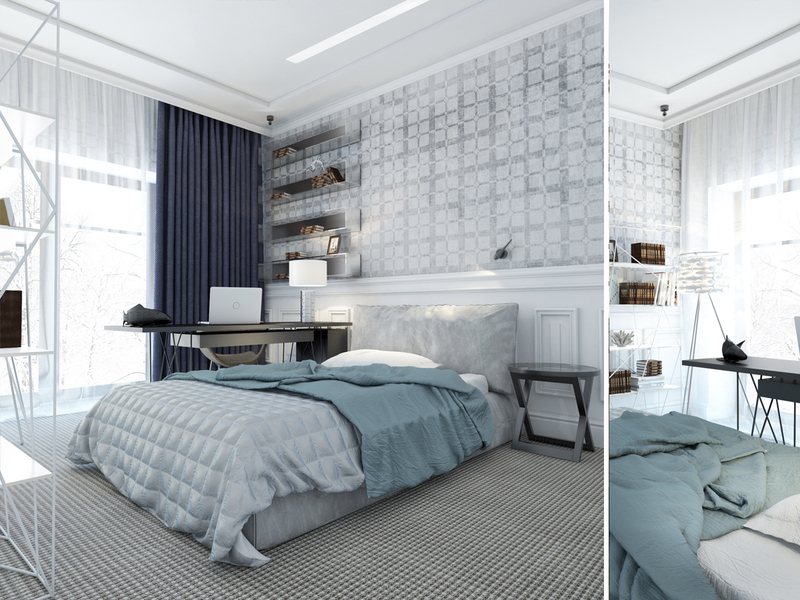 The architectural workshop of Azovskiy & Pahomova unites the talents of designers Oleg Azovsky and Anna Pakhomova. 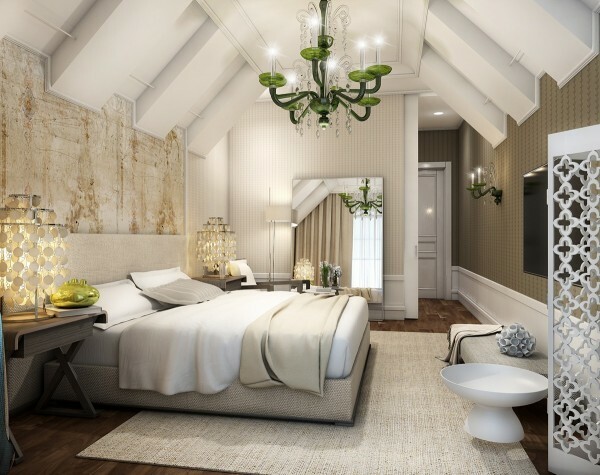 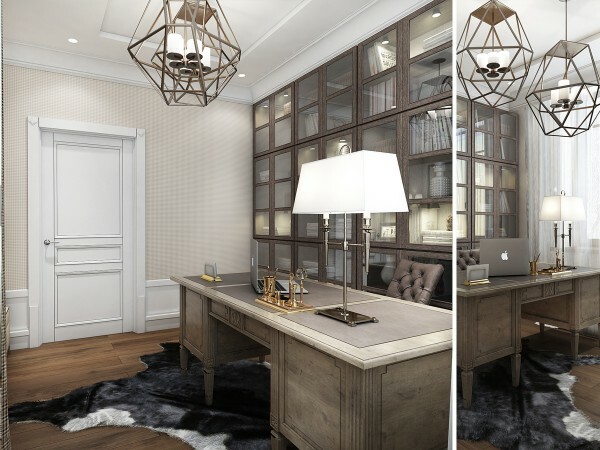 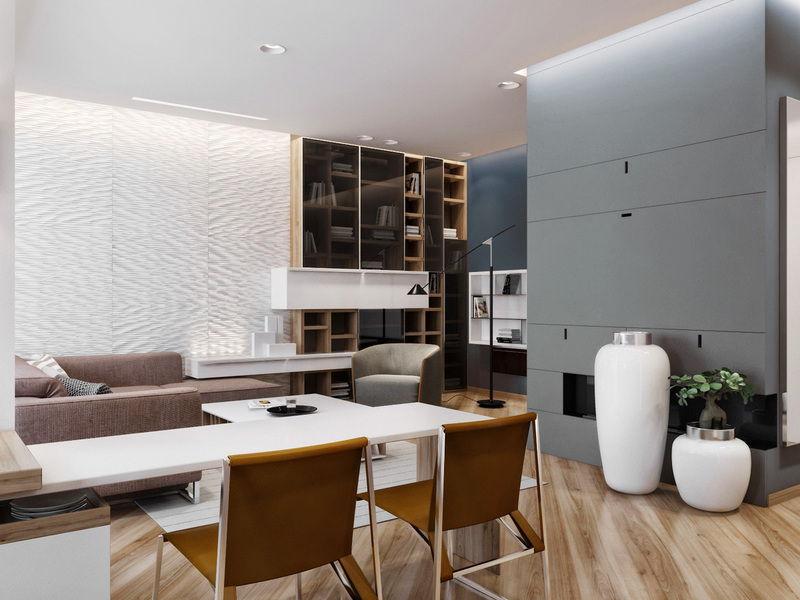 The result is a team that creates interiors for their clients that are indicative of exacting taste, professional training, and an all-encompassing ability to listen to the needs of their clients. 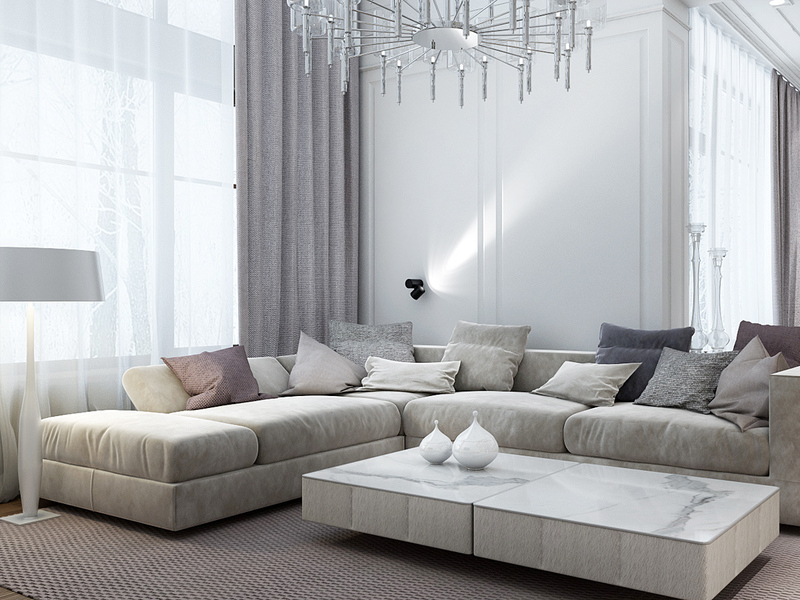 Interiors from this firm are replete with beautiful pieces from top to bottom, but never forget the functionality required of even the most stylish homes. 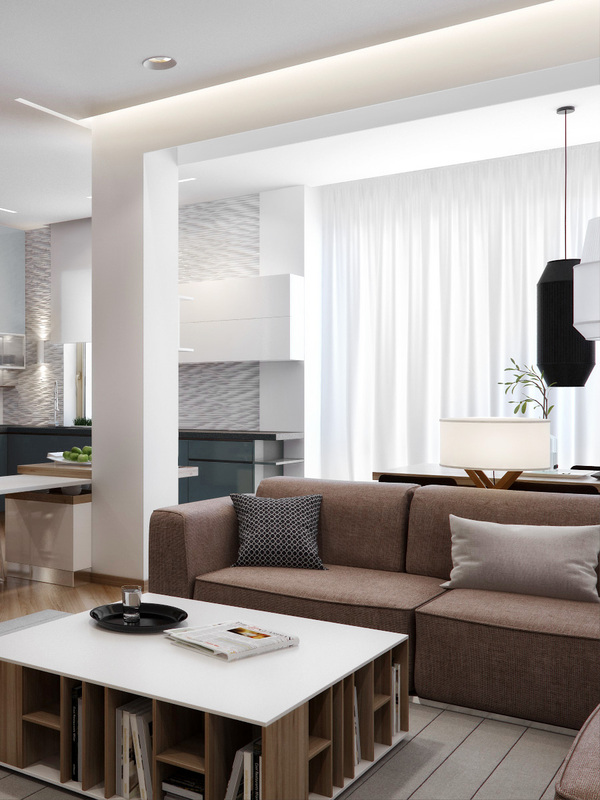 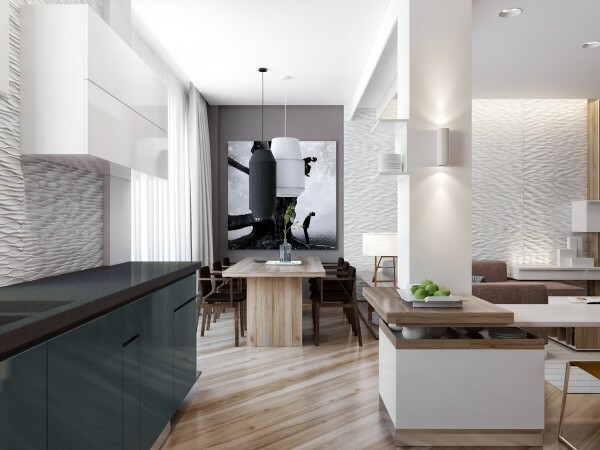 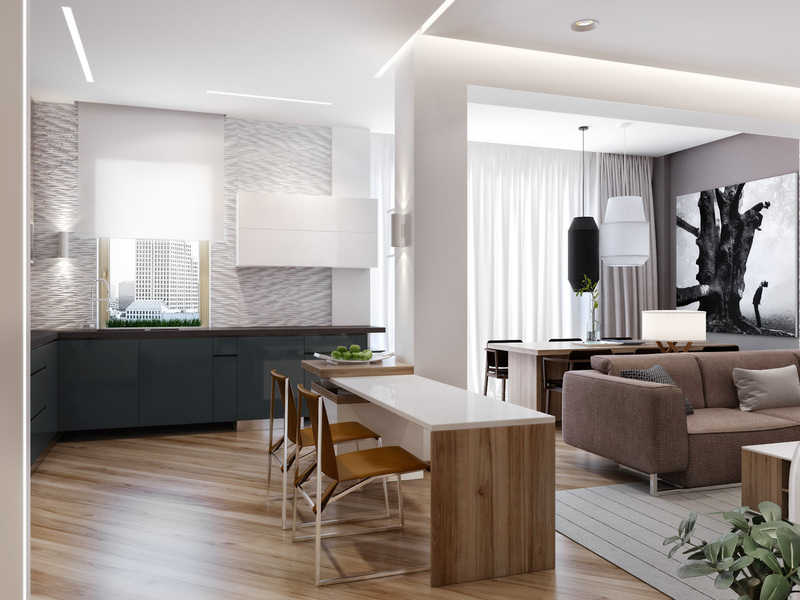 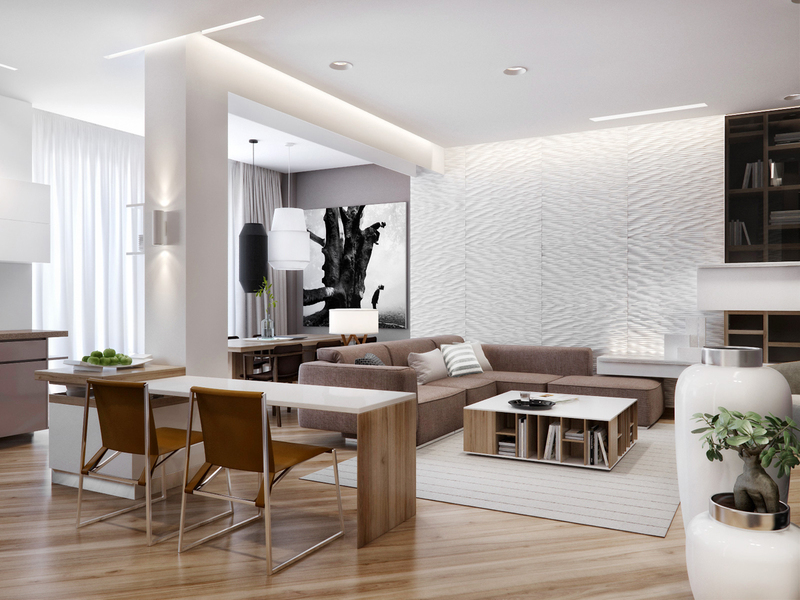 Here we explore an urban apartment that offers clean lines and uniquely playful design elements as well as a house with soft, modern appeal. Working within an urban environment always means making concessions for space. 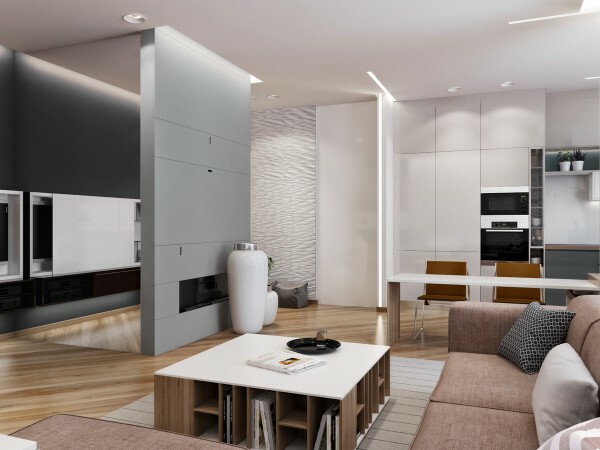 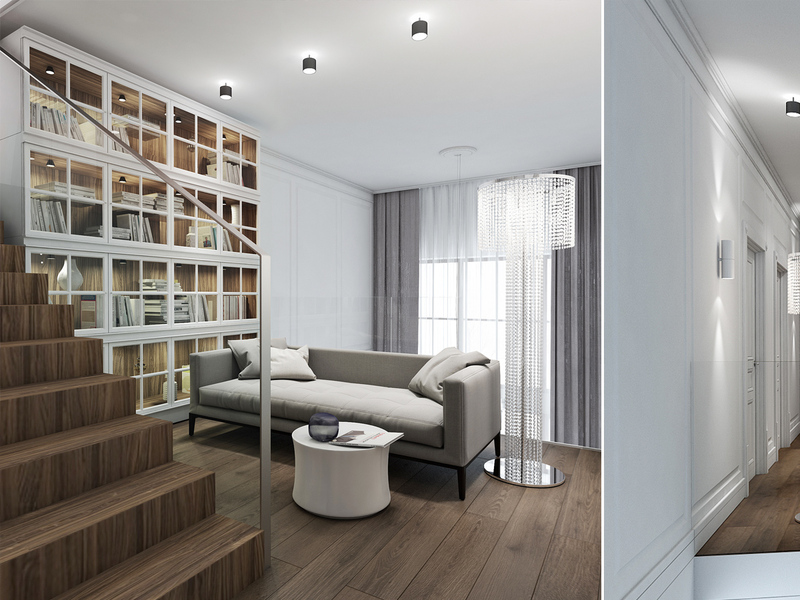 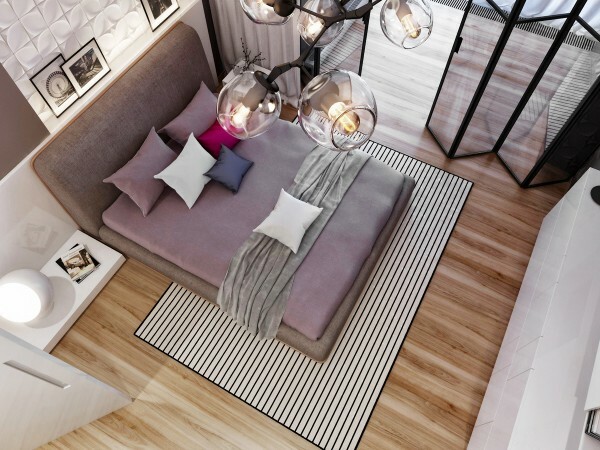 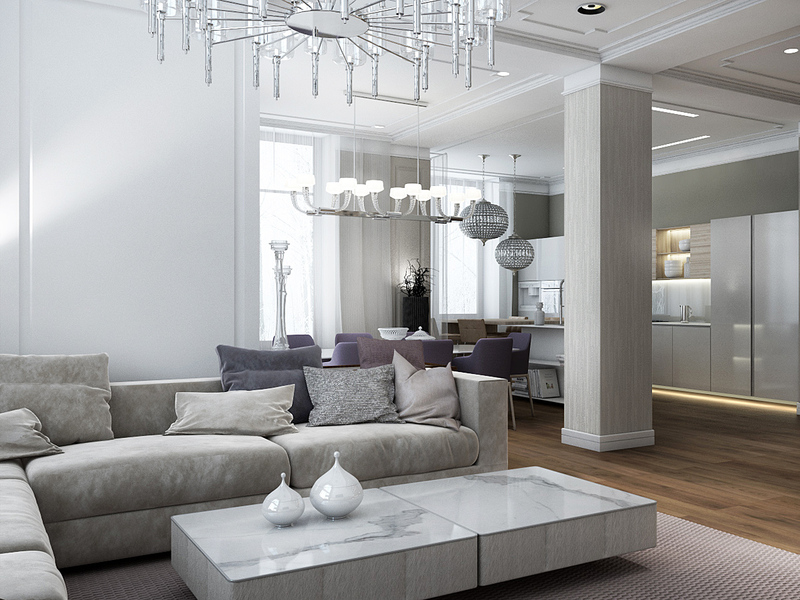 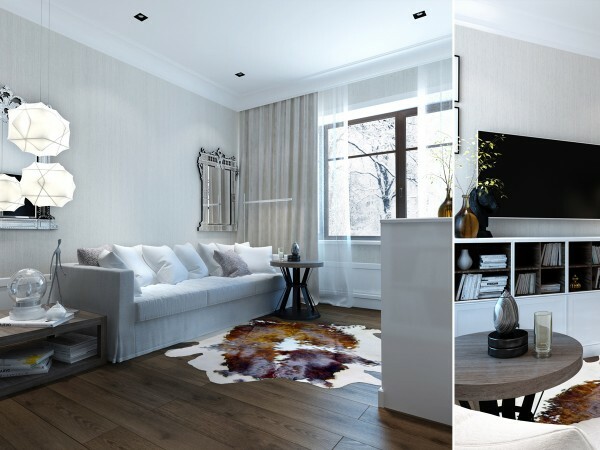 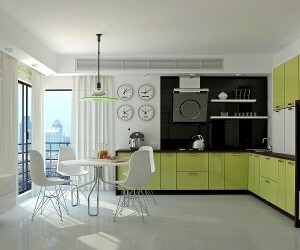 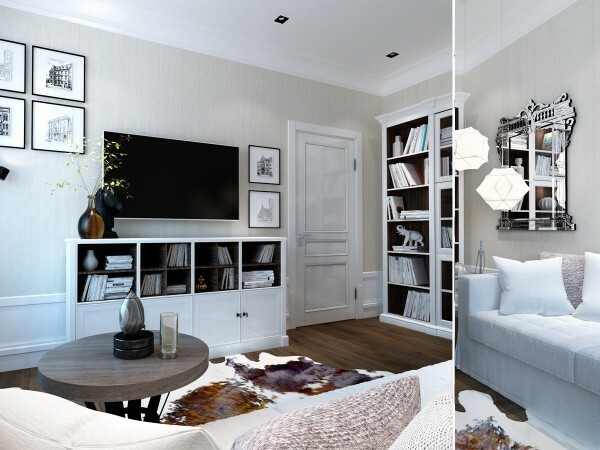 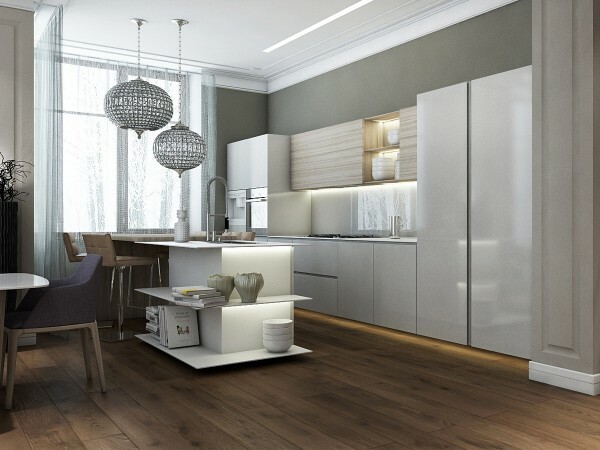 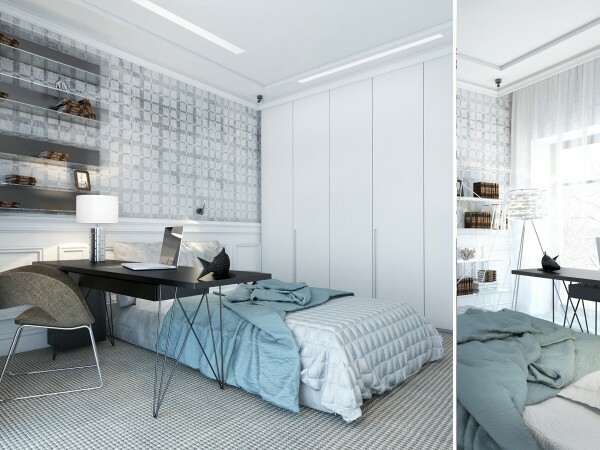 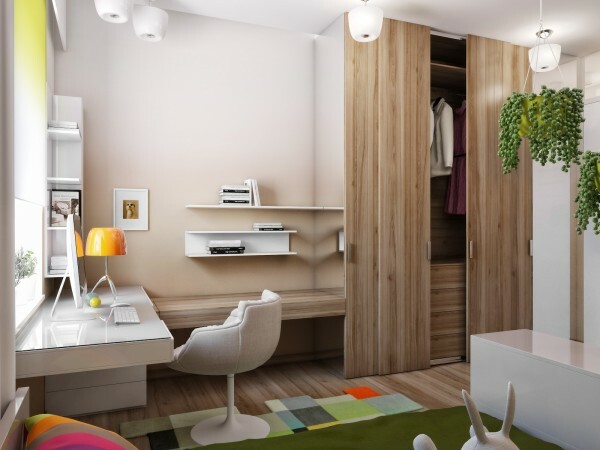 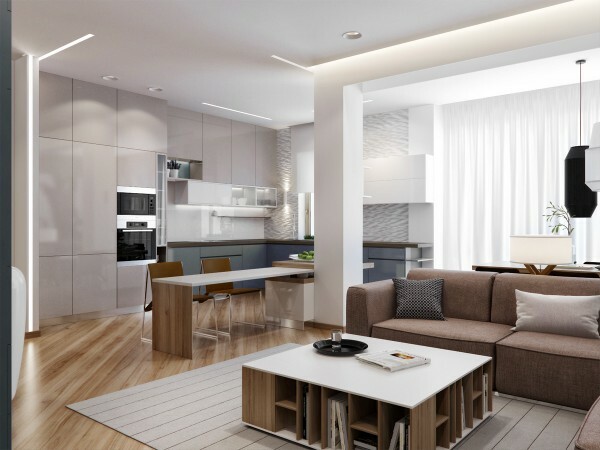 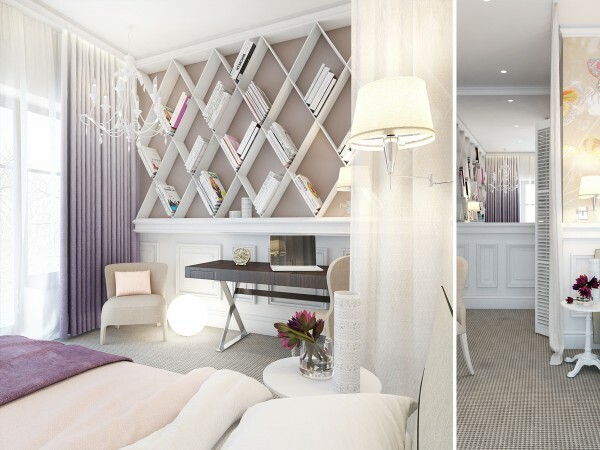 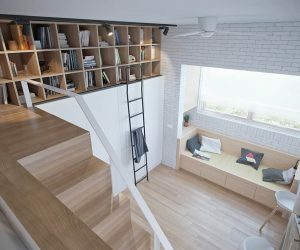 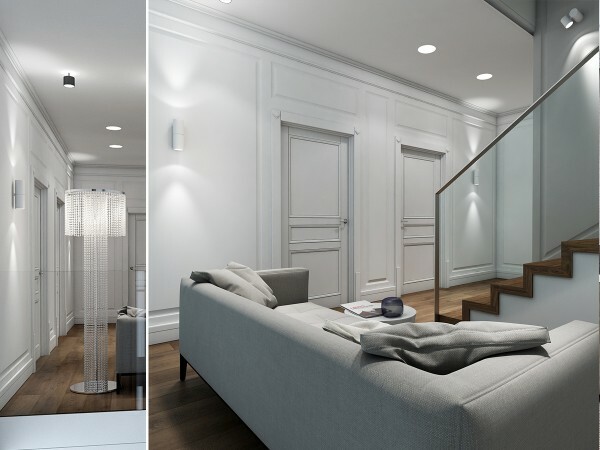 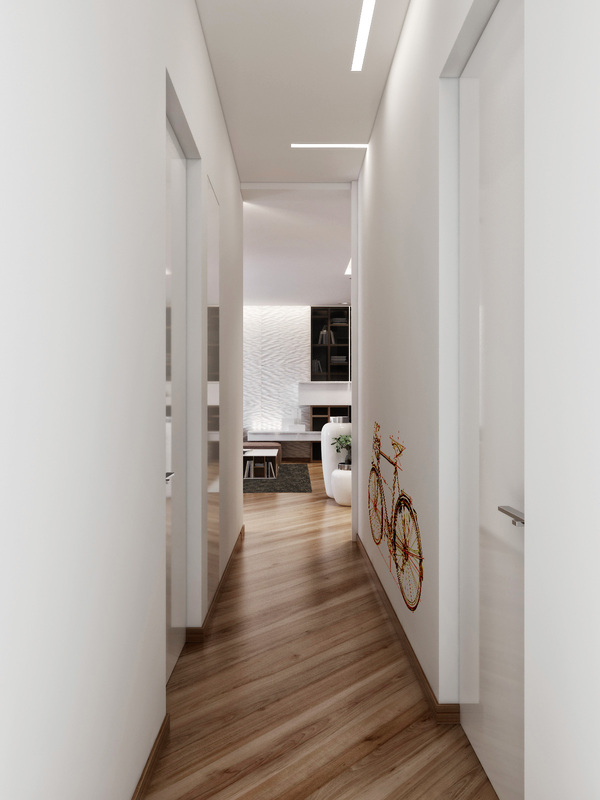 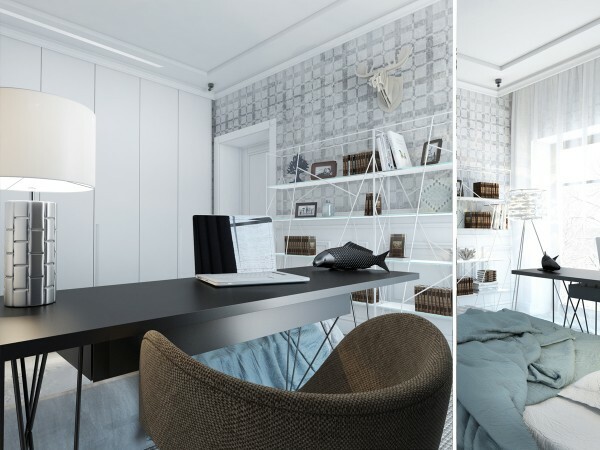 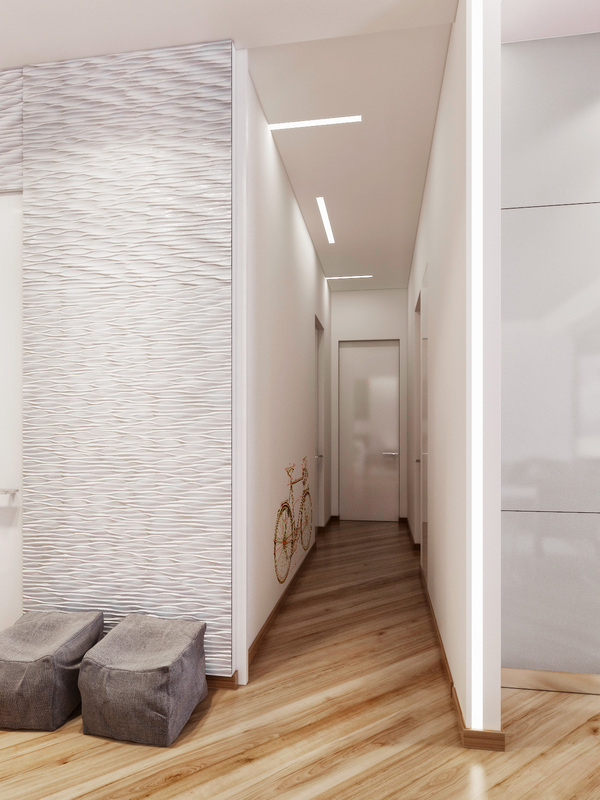 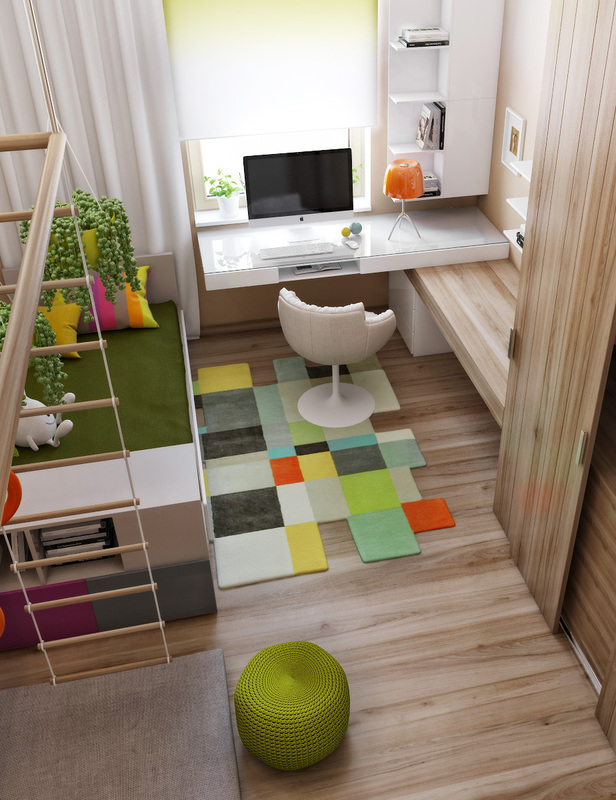 This 125 square meter apartment requires clever room separation and lots of light to create the illusion of more space. 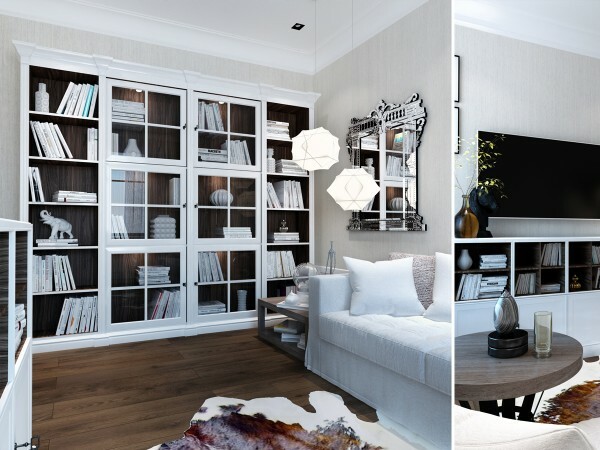 Storage built in to the coffee table is clever and stylish way to maximize space. 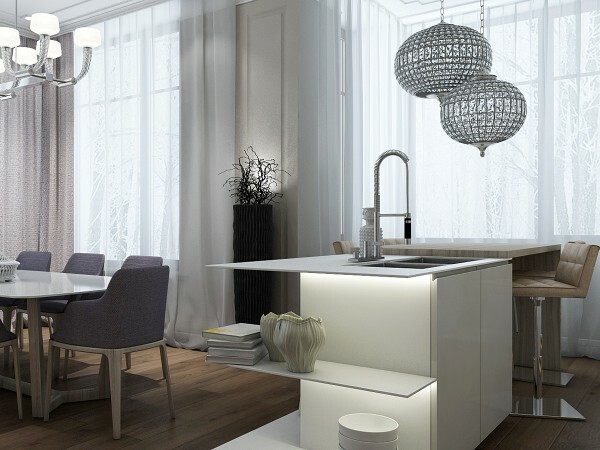 Even an apartment can make space for a breakfast area with this low countertop that doubles as a breakfast bar. 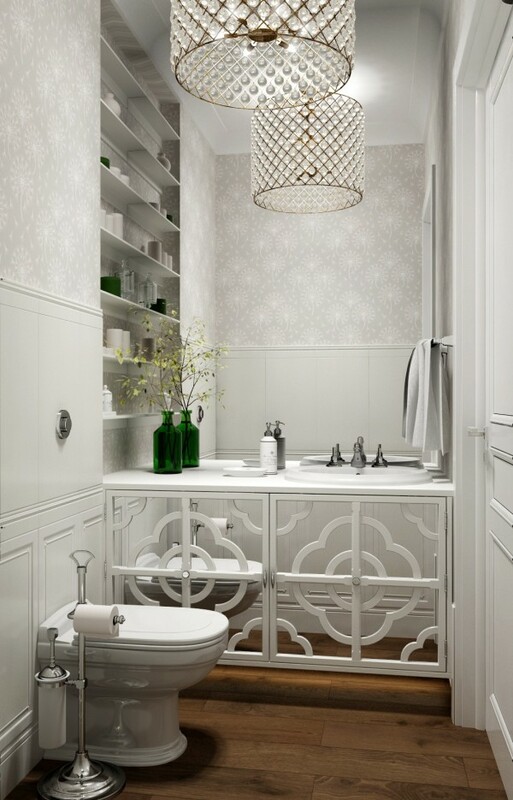 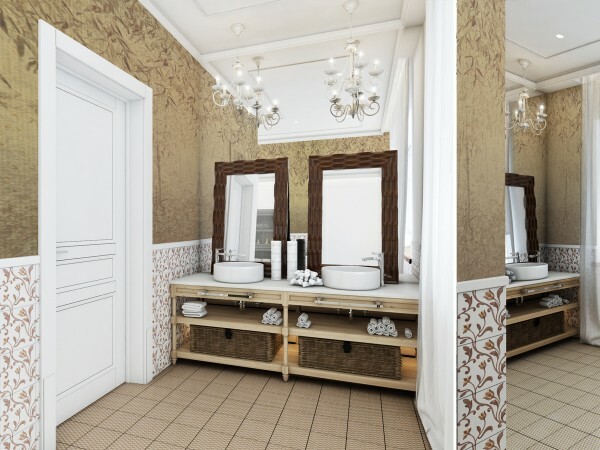 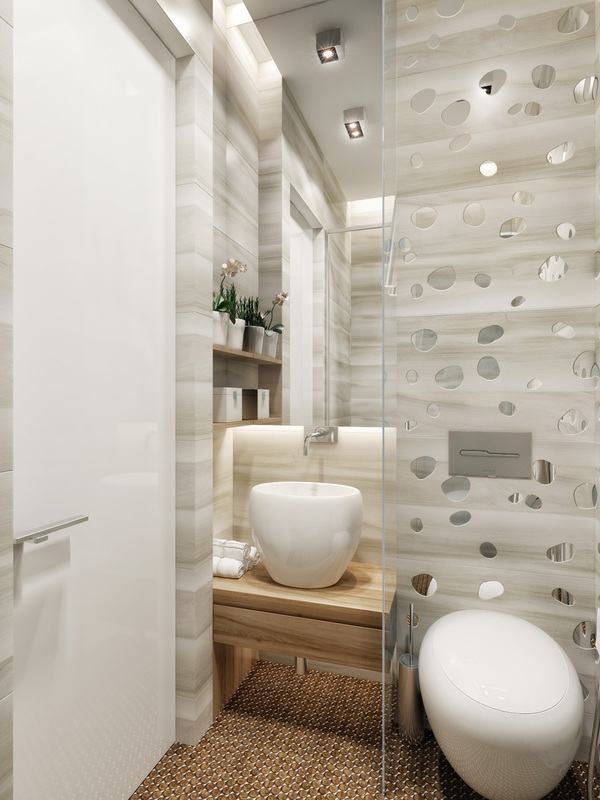 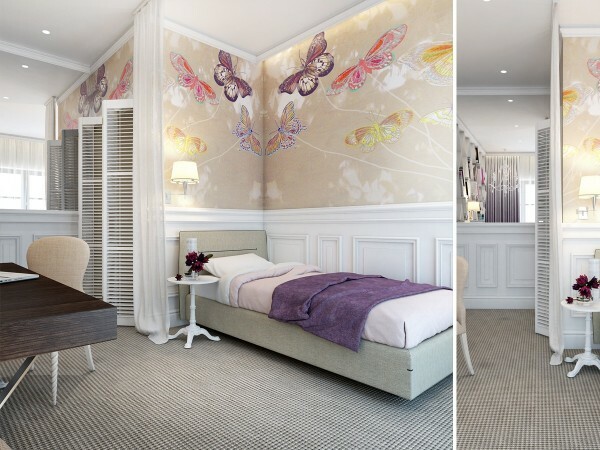 Adding artwork in the form of decals dresses up walls in a narrow hallway without taking up any precious room. 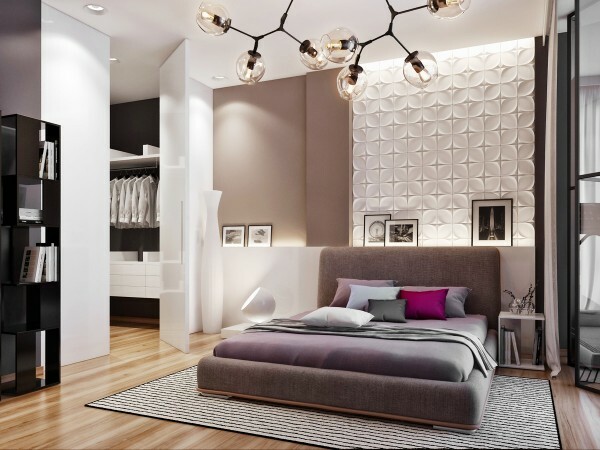 Even the most modern interiors make space for colorful accents in the way of children’s rooms, still using muted tones to blend with the rest of the decor. 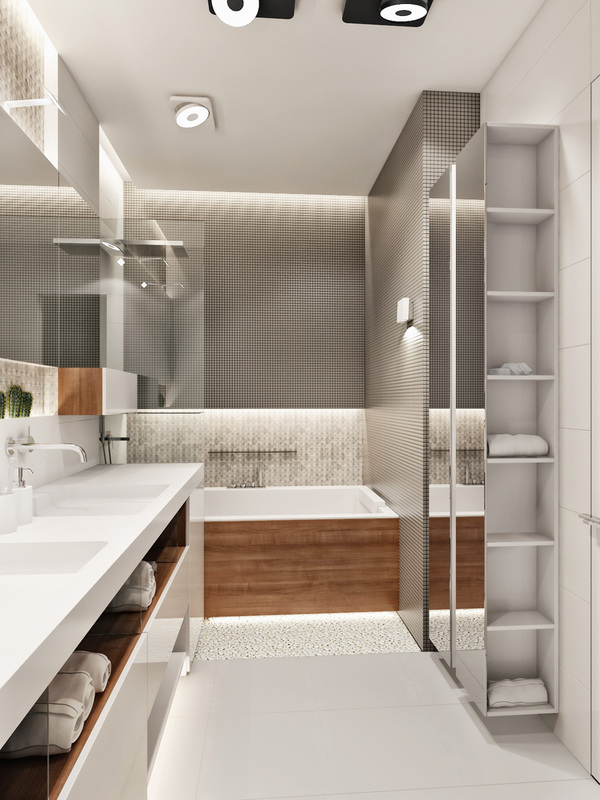 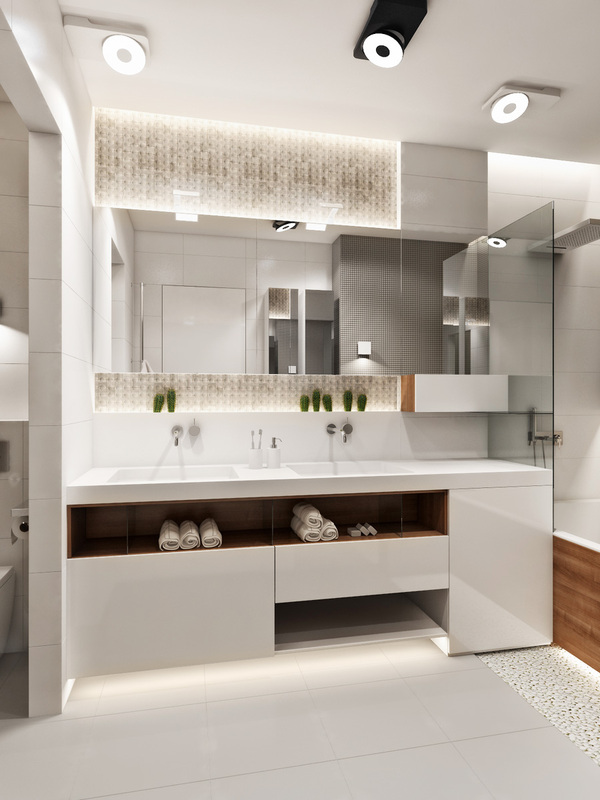 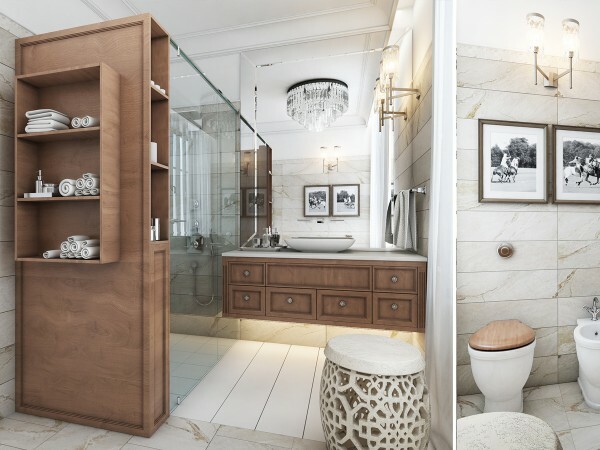 Clean white countertops and plenty of mirrors, with tucked away storage under the his and hers sinks, are useful in keeping the bath clean but never cramped. A plush section offers an inviting focal point for this living area while the cool, earthy neutrals chosen for the color palette urge visitors to take a step into a more tranquil state of being. 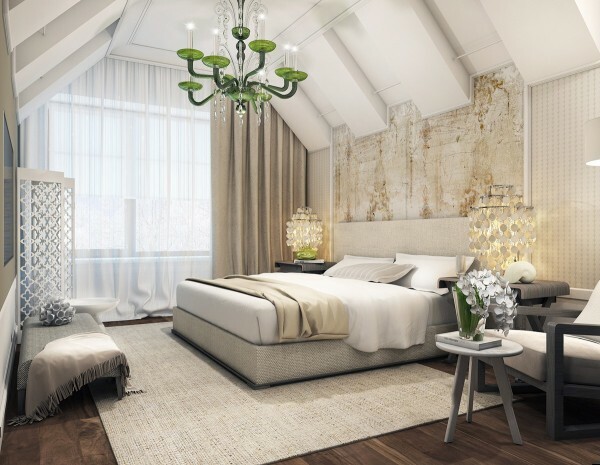 Green glass has an antique feel and brings a bright, natural element inside, playing nicely with the stone accent wall and dark wood flooring in this brightly lit bedroom. 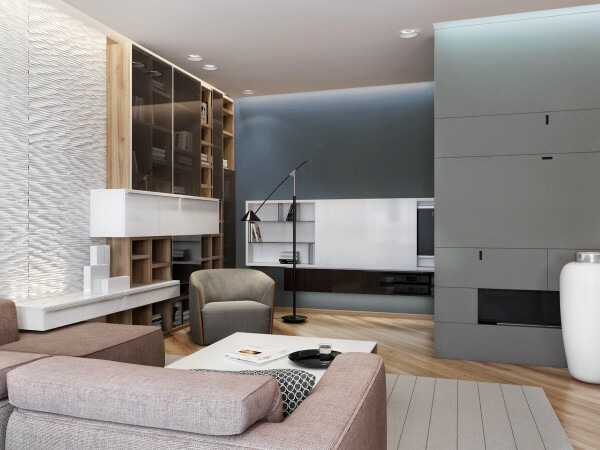 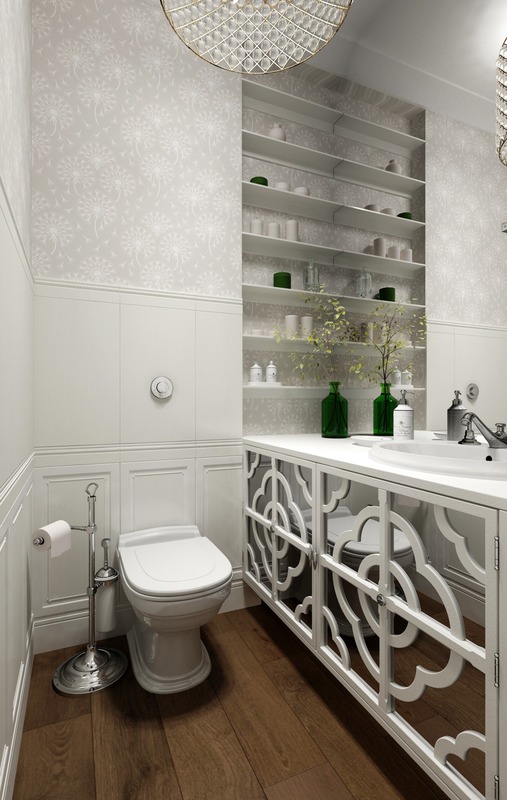 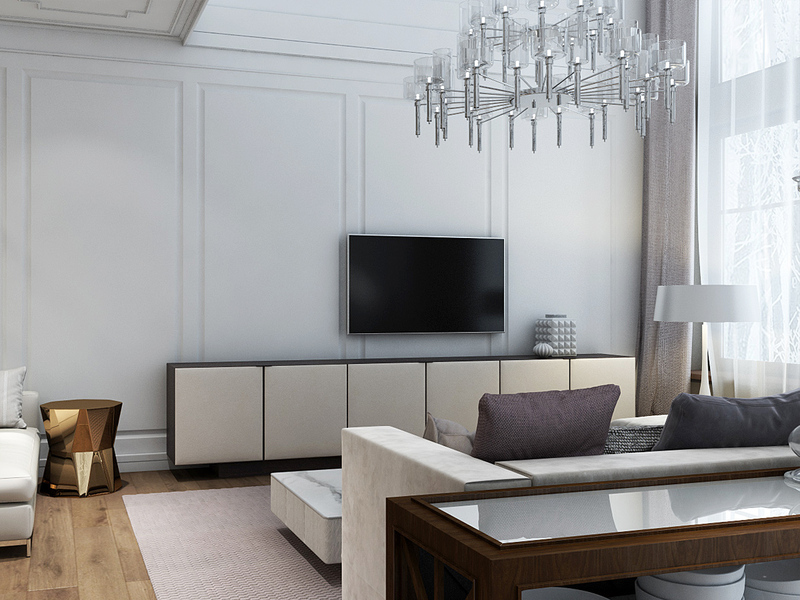 It can always be a challenge to marry modern storage requirements with compelling design. 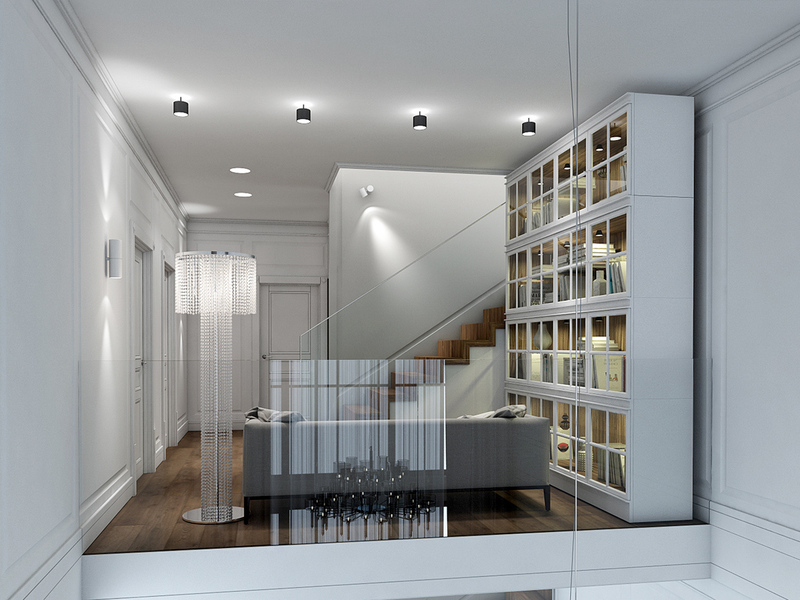 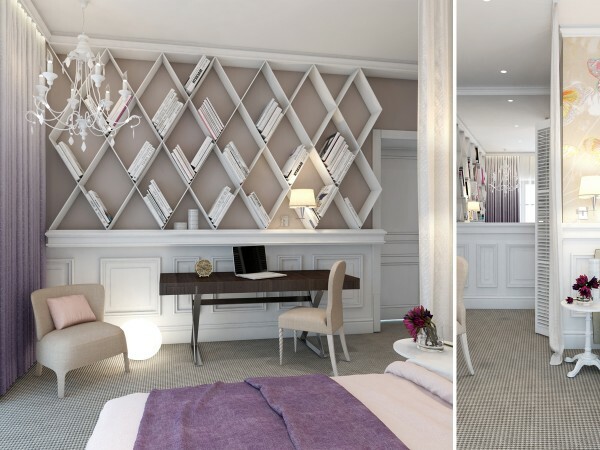 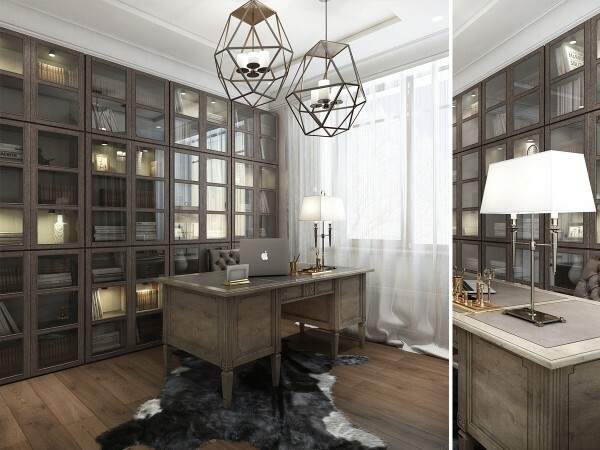 Here, the team has made the built-in bookshelves an impressive element that allows the homeowners to display or hide as much as they want with recessed lighting options.